Carson City’s Central School sat at the corner of Minnesota and Telegraph Streets. This view is of the front of the school, the east side that faced Minnesota. You can just see the rise of C Hill on the right-hand side of the building. It was built around 1872, and was the largest school in town. 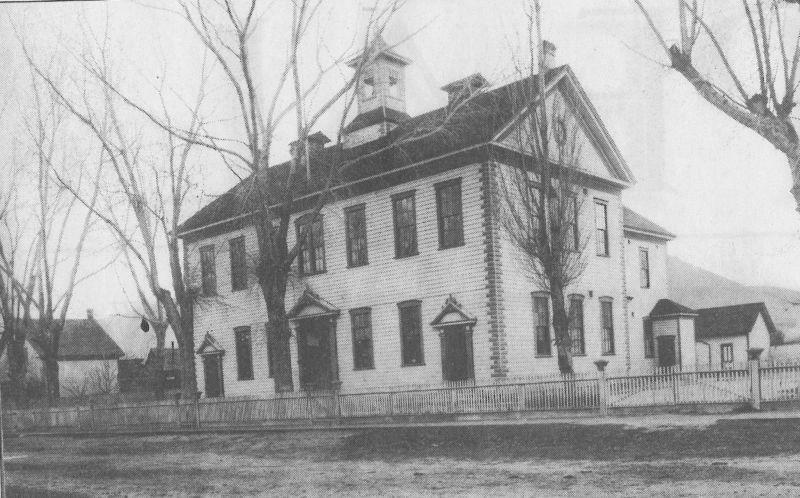 Some students attended the smaller schools on the edge of town, like the North Ward and South Ward Schools, but the majority of them made their way every day to this two-story edifice, located near the Capitol amongst houses and churches. There was even a carriage house in the back for students that could drive themselves. You can see it peeking around the building on the right side of the picture. The Central School survived until 1906. In that year, a new brick schoolhouse, three stories tall and taking up an entire city block, was built just a couple of blocks away. Overshadowed, and with its usefulness outlived, the Central School was torn down after the new school opened. Today there are no more classes being held at the corner of Minnesota and Telegraph. After the school was torn down, the lot it sat on was bought by Dr. Simeon L. Lee, a noted local surgeon. Or perhaps he bought the whole school and tore it down himself. The timeline isn’t really clear here. But what we do know is that Dr. Lee split the lot into two parcels and sold the south part to H.H. Springmeyer, a Carson Valley rancher, who built a house at 302 N. Minnesota, on the left of the picture above. Dr. Lee then built himself a house on the north parcel, at 340 N. Minnesota. It’s rumored that wood from the doomed schoolhouse was used in the construction. By 1908 or 1909 both houses were finished and lived in, and both of them still survive today. H.H. Springmeyer lived in his house until 1927, when he sold it to State Treasurer George Russell. 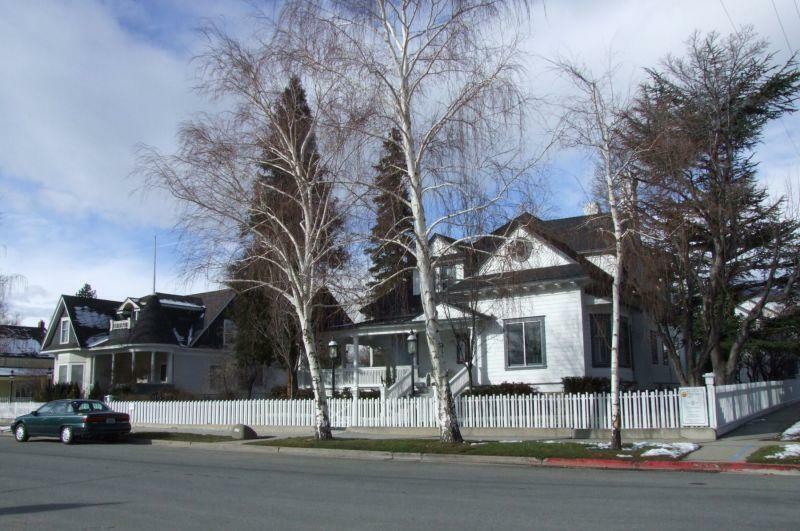 The house stayed in the family and was later the home of Charles Russell, Nevada’s 20th governor. He and his wife lived there until 1975. The Springmeyer house is now the offices of John C. Cowee, Certified Public Accountant. Dr. Lee stayed in his house until his death in 1927. He went on to become much more than just a surgeon, filling the roles of Secretary of the State Board of Health and then State Health Officer. He was also a collector and philanthropist, filling his house with Indian artifacts, fossils, guns, crystal, tiffany, and other works of art. After his passing his widow lived in the house for a few more years, but eventually sold it to Judge Clark Guild. Judge Guild was a prominent and well-liked justice, as well as a powerful force in Carson City. It was Judge Guild who organized the first Nevada Day parade in 1938. Similar celebrations had been held in Reno during the 30s, but they were small, and getting smaller each year. Judge Guild saw the importance of celebrating Nevada’s admission to the union, so he banded together with a Reno ad exec to put on a parade in the capital city. The first parade was on October 31, 1938, and the following year Nevada Day was made an official state holiday. It was also Judge Guild who founded the Nevada State Museum. He saw the need for the state to have a museum, even though most of his friends didn’t, and when the federal government put the old Mint building on Carson Street up for sale it was Judge Guild who urged the state to buy it and led the effort to gather artifacts and remodel the building. When the museum opened in 1941, the collection of Dr. S. L. Lee, the collection that had been amassed in the same house Judge Guild was living in now, was on prominent display. Lee’s wife had donated it after his death. As a judge, Guild used the front parlor of his own house to conduct wedding ceremonies. And as a neighbor, he became so close to the Russells next door that his daughter Marjorie ended up marrying their son Charles, and the two of them went on to become Governor and first lady of Nevada. Judge Guild lived at 340 N. Minnesota until his death in the 1970s, and after his passing the house was sold to members of the Scripps publishing family. The Scripps only lived here for four years, but during that time they did extensive remodeling, updated the plumbing and electrical systems, and painted all of the solid mahogony woodwork white. After they moved out the house was sold again, and since 1978 this has been the home of Resource Concepts, Inc., a local civil engineering and resource management firm. And remember that carriage house that was peeking around the corner of the building? It’s still there. 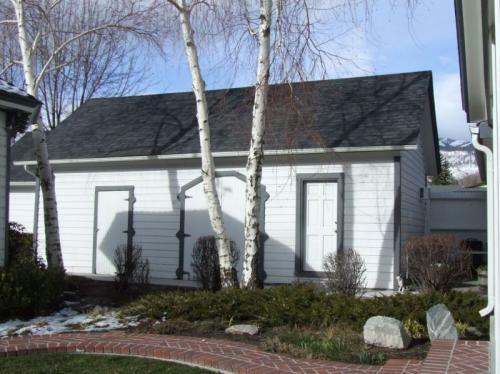 The old carriage house, now storage space for blueprints. Also, the woodwork in the house is still painted white. There’s another picture of the Central School in Then And Now #12.